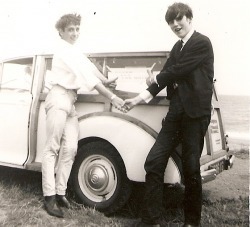 During 1962 aged 16 I met a guy called Raymond Jackson, he played guitar for fun something I found very interesting. Having listened to him strum along I decided I would also like to do that so I asked my dad to sign up a higher purchase agreement to buy a Rosette Bass guitar for £ 17.10 shillings. As my friends had 6 string guitars I thought bass would be best and easier to play. On my way to youth club in Coronation Street Elland I heard and could see through his window, a young guy playing guitar. I knocked on his door and asked if I could join him and learn to play guitar. His name was Chris Letza and he and his father played traditional music in a Polish Club in Halifax. I loved it, in my mind I knew then I would be in a band, I was hungry to learn. 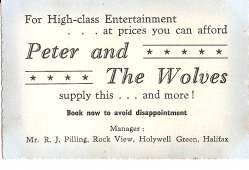 Early in 1963 Chris and I learned that two other guys in Elland were starting a group in consisted of a drummer, Peter Thomas, and singer Keith Steeples. We met and decided to form a band, Peter was the drummer and his dad owned a bakers shop that had a cafe upstairs where we could practise in the evenings. So with Chris and myself plus Raymond and the two others we started the new venture. We had seen Screaming Lord Such perform in Huddersfield and they played an instrumental ( maybe Hall of the Mountain King) where they circled their guitars around pointing at the audience, it looked great. Someone said the tune was called Peter and the Wolf so we came up with the idea of naming ourselves Peter and the Wolves and we pinched the tune as our signature tune. Peter was not the leader, however the name we liked and after all we practised at his place and he had transport, so why not. After a while we jointly agreed that two of the band members were not good enough to progress at the rate we wanted so with sadness Keith and Raymond ( 3 years older than us) had to depart. We replaced Raymond with a friend of Peters named Tony Aspey and we managed to get a well known local singer form a band called The Thunderbeats his name John Bell. John was a bit older than us but he had already done the pubs and clubs so he had something to bring to the party. 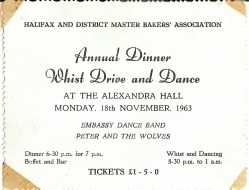 Bookings came easy as in 1963 there were not so many bands but a great demand. Pubs, dance halls and working mens clubs were crying out for bands. Also if you played in a band, even if you were rubbish, many girls wanted to become groupies. We appointed a manger, Roger Pilling, hopefully he could bring marketing skills to the band. First business card.... over sell maybe ?